Alltown Fresh, An Innovative Fresh Convenience Market, Opens In Mass. 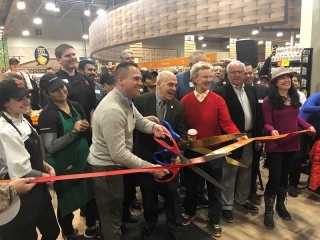 Alltown Fresh is a one-of-a-kind market that opened at 22 Long Pond Road in Plymouth, Massachusetts, on Jan. 16, to guests anxiously awaiting the fresh food choices the market has to offer. Kristen Brissette, from Shelby Publishing Co.’s Northeast staff, was treated to a personal tour of the store just days after the opening. See photos of the new store here. Greeted at the door by Store Manager Courtney Pierce, guests are informed by Pierce and her Alltown Fresh team about the fresh concept of the market. It is not a convenience store; it is a fresh convenience market—emphasis on “fresh.” The focus is making healthier on-the-go choices available. In addition to fresh, organic food to go and an in-store café, the modern store offers gas pumps (including diesel), indoor and outdoor seating, groceries, a beer cave, Wi-Fi, an ATM, pet relief areas, traditional snack options, and phone and electric vehicle charging stations. When guests walk through the door, there is an assortment of fresh flowers as well as Swiss Made “bean-to-cup” coffee machines—the only ones in New England—to instantly brew a cup of locally roasted coffee beans into fresh hot or iced coffee. These machines feature blends from around the world, such as Fair Trade and organic Monadnock Blend, Stratton Blend and Guatemala San Marcos. Milk and cream are not the only add-ins available; Alltown Fresh also offers almond milk and flavor shots to add to the cup. Made-to-order classics such as nitro cold brew, macchiatos, lattes and smoothies blended with almond or coconut milk are available. A nut and seed bar allows guests to select a special nut or make a mixture of their choice. Store-made specialty granolas also are available and are used in the store’s kitchen. Part of the Global Partners LP family of brands, the 4,800-s.f. market is all about choice. Healthy, fresh foods in the store as well as from the kitchen where made-to-order food items are ordered at a self-serve kiosk giving guests plenty of organic, natural, gluten-free, vegan, vegetarian and locally sourced options for any dietary preference. The options feature locally sourced products from the Plymouth area, such as using bread from Hearth Artisan Bread located a few miles away. Curated breakfast options such as Clean Green Avocado Toast, complete with cage free eggs or tofu, spinach, fresh avocado, chia seeds and Himalayan sea salt on guests’ choice of bread, which is locally sourced from Hearth’s Artisan Bakery in Plymouth. Specialty protein bowls, featuring locally sourced dressing from Cindy’s Kitchen in Brockton, such as Korean Kim Chi, made with baby peas, shredded purple cabbage, shredded carrots, sautéed mushrooms, quinoa and Korean Kim Chi sauce, and Mango Tango, complete with roasted summer squash, roasted zucchini, roasted peppers, roasted red onions, shredded carrots, three grain brown rice blend and a mango coconut pepper sauce. Wholesome sandwiches on guests’ choice of bread, such as the Fresh Pilgrim, featuring roasted turkey breast, quinoa, homemade cranberry orange relish, and mayo. Also, Veggie Palooza, made with fresh avocado, shredded purple cabbage, shredded carrots, green leaf lettuce, sliced tomatoes, red onions, garlic hummus and pesto. 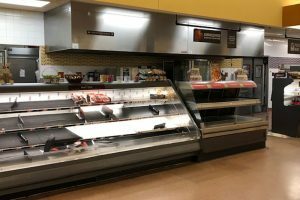 The market features a wide selection of grab-and-go favorites and healthier packaged alternatives for when the kitchen is closed or for guests to take home and enjoy. The store is open 24 hours a day, seven days a week. The hours of the kitchen are 6 a.m.-8 p.m., with the expectation of the hours being extended in the future. A variety of organic, self-serve beverages are on tap for guests to serve themselves, and the market encourages guest to try each. Five non-GMO soda alternatives sourced from Tractor Beverage Co. as well as certified fair-trade options made with organic cane sugar from Maine Root Beverages are “good for you” soda choices. The market makes fresh, organic juices onsite available at the self-serve juice bar. Kombucha on tap from Vermont-based Aqua ViTea is available in four different flavors. Beverage choices in the soda system as well as the kombucha system can be switched out to offer a variety of selections. The market also offers traditional drinks in the many refrigerated cases. The Alltown Fresh Beer Cave gives guests the option of purchasing a single bottle of beer, a six-pack of beer or a larger 30 pack. A guest can open a glass door to select a chilled can or bottle or walk into the “cave” to select a larger offering. Alltown offers local craft beers to their guests as well as national brands. 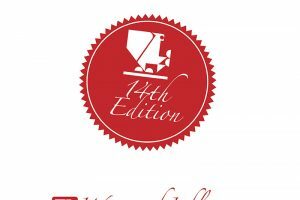 Wine is also available. An area of the store is dedicated to sell locally sourced products such has honey, pasta sauce and jams and jellies. Ryan Riggs, SVP of retail operations at Global Partners LP, emphasized the fresh aspect of the market: “This is not a convenience store; it is a convenience market with natural, organic and locally sourced items being offered to our guests.” He wants guests to have an experience. 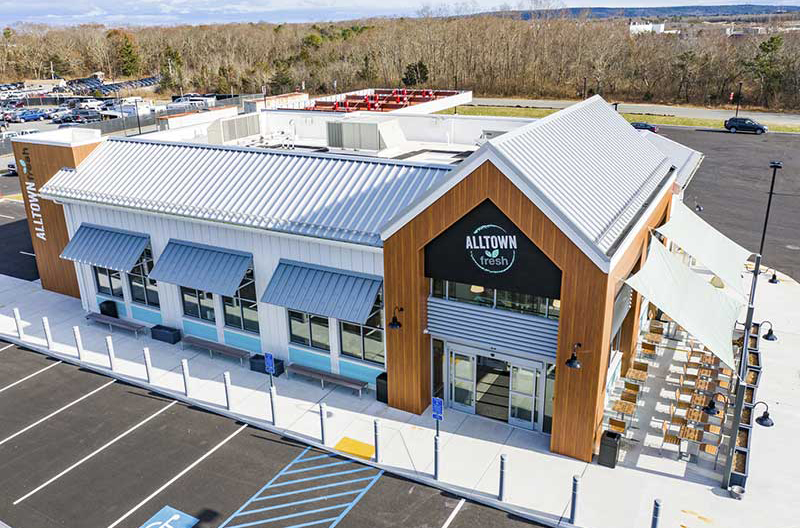 Global Partners selected Plymouth to test the first Alltown Fresh store because of the local demographics and accessibility. “This area fits well with our core market. There are two demographics we are targeting: millennials and moms. Millennials are more focused on eating healthy and will seek out fresh and natural food. Moms, of course, are looking for good things for their children,” Riggs said. Outside the store, the gas pumps include 12 regular fueling spots in the front of the market and three high-speed diesel-fueling stations in the rear for 18-wheeler trucks. Alltown Fresh will also offer four Electrify America direct-current fast chargers (DCFC) to serve customers with electric vehicles (EVs). The chargers range in power from 150kW to 350kW. Electric vehicle chargers that offer 350kW are capable of delivering energy for up to 20 miles of range per minute, which is seven times faster than most of today’s DC chargers. These chargers are part of Electrify America’s national network of high-speed workplace, community, and highway EV charging stations. Global Partners has been an independent owners, suppliers and operators of gasoline stations and convenience stores. 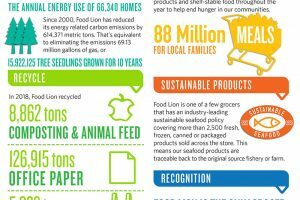 As part of the Global Partners LP family of brands, Alltown Fresh offers the local community healthy, fresh food choices and made-to-order meals.